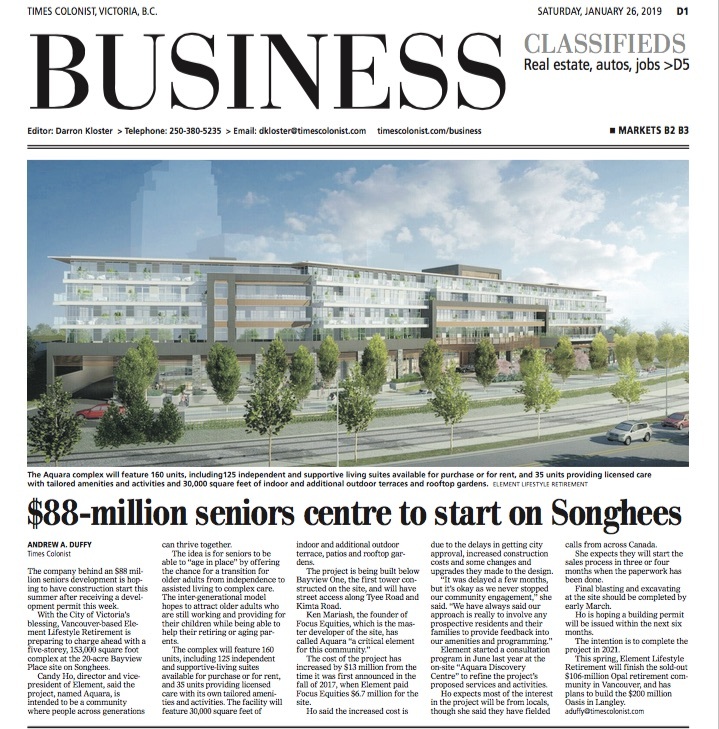 The company behind an $88 million seniors development is hoping to have construction start this summer after receiving a development permit this week. Candy Ho, director and vice- president of Element, said the project, named Aquara, is intended to be a community where people across generations can thrive together. The idea is for seniors to be able to “age in place” by offering the chance for a transition for older adults from independence to assisted living to complex care. The intergenerational model hopes to attract older adults who are still working and providing for their children while being able to help their retiring or aging parents. The complex will feature 160 units, including 125 independent and supportive-living suites available for purchase or for rent, and 35 units providing licensed care with its own tailored ameni- ties and activities. The facility will feature 30,000 square feet of indoor and additional outdoor terrace, patios and rooftop gardens.